Release Date: November 27, 2013 – U.S.
Information is taken for granted today. We can choose a good book to read (or favorite movie site to surf) without giving it a second thought. But far too recently in our history, books were burned and the act of reading certain authors or ideas was considered forbidden fruit. "The Book Thief" tells the story of a young girl, Liesel (Sophie Nélisse), who loves to read and can't stand the thought of any type of writing being censored. She rebelliously sneaks in and "borrows" several forbidden tomes from a wealthy neighbor. The title of the film becomes her eventual nickname. As the story begins, Liesel's mother is forced to give her up to another family. They're living in Germany during the time of Adolf Hitler and the Nazi Party. Liesel's new mama, Rosa (Emily Watson), is stern and sharp with her tongue. Already cruelly torn away from everything she has ever known, Liesel now has to adjust to new parents, a new town, and a new life. Rosa's cold demeanor does very little to put the frightened child at ease. But these are harsh times, and one has to be tough just to survive. 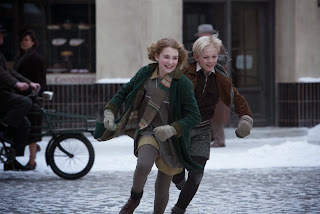 Still, Liesel's new papa, Hans (Academy Award winner Geoffrey Rush), has a softer touch. He makes the girl feel welcome and comforted by referring to her as "Your Highness." Slowly but surely, Liesel adjusts to her new life. She quickly makes a friend – a "lemon-haired" boy named Rudy Steiner (Nico Liersch) who wants nothing more than to kiss her. But this is Nazi Germany, where no one can dare remain comfortable or complacent for long. Everything can change in the blink of an eye. A teenage hideaway, Max (Ben Schnetzer), soon comes knocking on Hans and Rosa's door. Like Liesel before him, they take him in – at great potential cost to themselves. Liesel proudly wears the uniform of a Hitler Youth without understanding what that really means. When she finds out exactly what the Fuhrer is against, she begins to have serious doubts. This, of course, coincides with her increasing love of literature. If only more of today's children could feel such reverence for the written word. While any movie about Nazi Germany is naturally going to weave in the historical, social, and political concerns of the time period, this is – above all – a story about relationships: Liesel's bond with Hans and even Rosa, Max becoming a brother to her, and her growing affection for Rudy. The little girl who plays Liesel takes it all in with her wide, expressive eyes. She anchors the film with a beautiful, natural performance. She's not alone. Every actor here disappears into their characters. From the acting and accents to the story and setting, everything comes together to create a completely immersive experience. Some movies are easy to write about. The words just come tumbling out. Others take time to process. They require reflection. "The Book Thief" has stayed with me for weeks. It is beautifully haunting. Any story that begins with a narration from Death is not going to be simple Sunday stroll. Yet, for most of the film's running time, there are only a few bumps on the road. But Death, like love, is patient – though it is rarely kind and never proud.